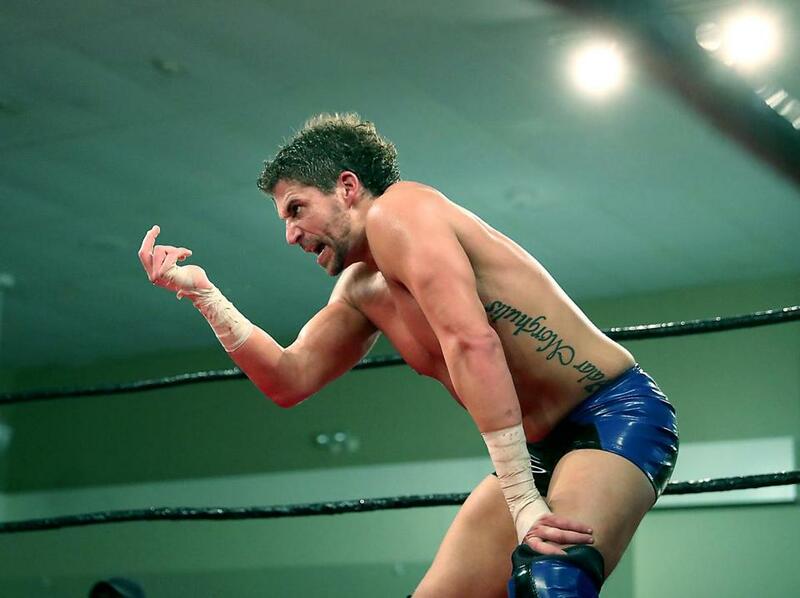 WOBURN — Chase Del Monte has barely begun his slow, swaggering jaunt toward the ring, and already the jeers have started in. “You’re a disgrace!” shouts an old man seated ringside. “Chase Del MORON!” comes a lone chant from the back. “Stupid idiot!” hollers a surprisingly hostile little girl. It’s a frigid Friday night, but inside the local Elks Lodge in Woburn — a squat brick building where bingo is going on in the basement — the 200 or so fans who’ve filled the small auditorium for an independent New England wrestling show are ready to work themselves into a froth. After standing in a line that snaked out the door a few hours earlier, then making their way past a makeshift bar in the corner and into the rows of metal chairs surrounding the ring, they’re brimming with enthusiasm.They’re here for the cheap beer and the cheap entertainment, of course. But also for something else. Here, in this makeshift arena 20 minutes outside of Boston, they can cast off the shackles of civility, leave political correctness at the door, and say whatever the hell it is they want. The vast majority of the time, Del Monte is an upstanding member of society, a mild-mannered logistics manager for a Waltham-based oil company. So, too, does the audience, a surprisingly animated and dedicated bunch that, at the moment, has fixed its ire on Del Monte, the smirking, strutting supervillain who is making his way toward the ring in leather jacket and sunglasses. But for 30 minutes or so once a month, he pulls on a pair of spandex shorts, laces up his $500 custom wrestling boots, and becomes a one-man repository for all the bile a crowd can throw at him. And he’s happy, certainly, to return the favor. All of it is designed to work the crowd up into a loud, boisterous rage. “I call him ‘The Disgrace That Runs The Place,’” says Jacob Wright, 11, of Medford. Fans Anthony Miller of Windham, N.H., and Michael Desroches of Manchester, N.H., cheered on Chase Del Monte at the match last month. 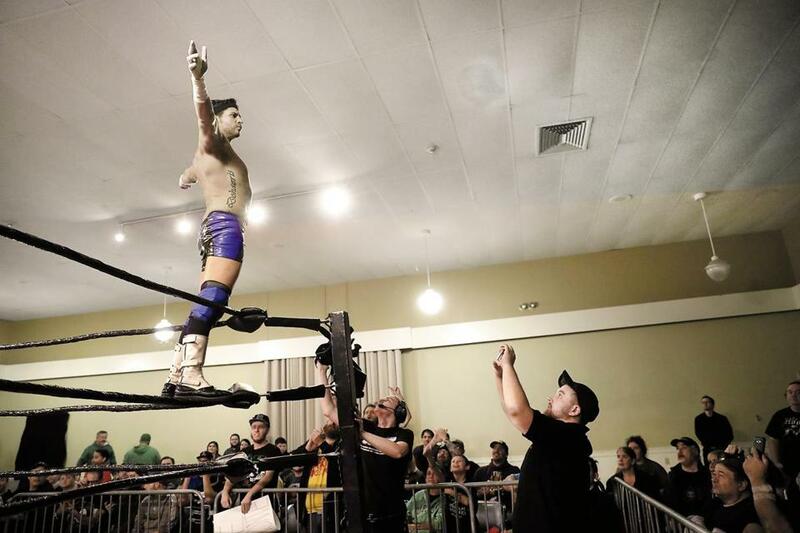 Live sporting events have long been a place for fans to spend a few hours blowing off steam, but it’s hard to imagine a more stark example than the world of small-scale professional wrestling, where the vitriolic dance between fan and performer isn’t just an accepted part of the production — it’s integral to its success. To be sure, this isn’t the WWE. The night’s match-up is put on by Chaotic Wrestling, one of dozens of small promotional wrestling outfits operating in New England. Most of the wrestlers have day jobs. They risk serious injury — there have broken bones, spinal issues, at least one ruptured testicle — for what might be a $50 paycheck and the chance to perform in venues ranging from the obscure (middle school gymnasiums) to the bizarre (mechanics’ garages). What it does come with, though, is a chance to perform for what must be some of the sport’s most loyal followers. Richard Woodard of Lawrence yelled at Del Monte as he got into the ring. 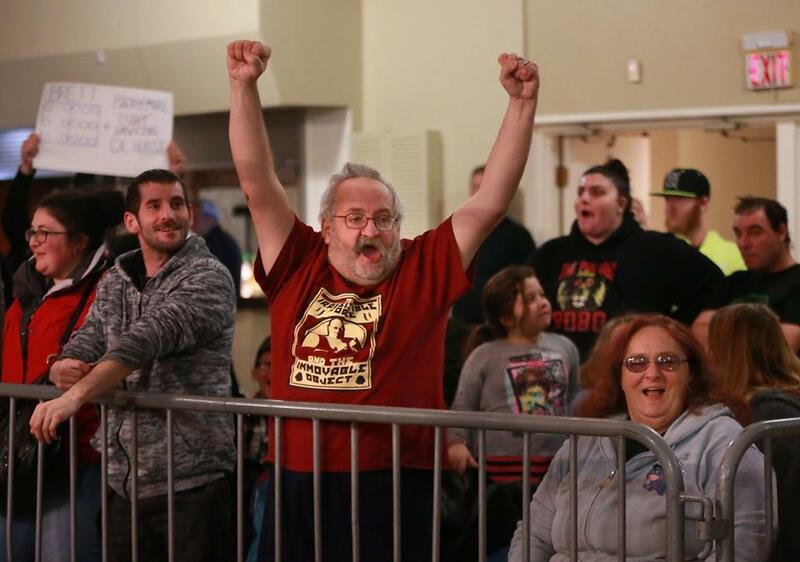 At the show in Woburn, some carry homemade signs or wear T-shirts depicting their favorite Chaotic wrestlers — purchased at the lobby merchandise tables — while others are able to instantly recall the exact move a wrestler had used to put away his opponent in a match held a year before. In the title match, Del Monte will attempt to take the championship crown from a young, handsome opponent named Elia Markopoulos, and as the evening’s early bouts played out, he stood watching behind a curtain in a makeshift staging area. Around him, large men in spandex readied themselves for battle — rubbing baby oil onto their biceps, styling their hair. Finally, around 10 p.m., it is time, and as he swaggers toward the ring, taking in the jeers and boos from the audience, Del Monte promptly begins living up to his sordid reputation. Del Monte egged on the crowd after entering the ring. For much of the match’s first 15 minutes, he puts on a clinic in unsportsmanslike conduct. He yawns when his opponent is introduced. He drags his opponent from the ring, flings him violently into the referee — the barrage stopping only long enough for him to taunt his battered foe and the crowd. “This is your champion?” he crows at one point. “I love to see you bleed!” shouts someone else in the audience. Del Monte (right) and Markopoulos were wrestling for the championship belt. In the match’s final minutes Markopoulos — himself an emerging villain in Chaotic Wrestling — unleashes a flurry of blows before eventually knocking a dazed Del Monte to the mat. One . . . two . . . three slaps to the canvas, and it’s over, Del Monte crawling away, defeated, Markopoulos grabbing his championship belt and preening for the crowd. Afterward, members of the audience lob their final few insults of the evening, lingering a bit before making their way — some smiling, some looking as physically spent as the wrestlers — slowly toward the exit. In a function room in the basement that the wrestlers had turned into a locker room, Del Monte — chest still pink with welts — smiles as he settles into a chair in the corner. Come Monday morning, he’ll be back in the office, the spandex shorts replaced by khakis, the bellicose boasts subbed out for more HR-friendly banter. For now, though, in the post-match glow, he sips a drink from the upstairs bar and savors his final few minutes as Chase Del Monte, the Disgrace That Runs The Place.